This panel explores art and creative practices and the human relationship to nature in the time of the Anthropocene and climate disaster. This panel will feature artists and thinkers including: Ming Fay, Skowmon Hastanan, Karen Holmberg (NYU), Christopher Kennedy and Andrea Haenggi of the Environmental Performance Agency (EPA), and curator for Ming Fay: Beyond Nature, Alexandra Chang. Sapar Contemporary is proud to present Beyond Nature, Ming Fay’s first exhibition with the gallery. Ming Fay: Beyond Nature features selected works of Shanghai-born, New York-based artist Ming Fay from the 1980s to the present. Like Alice in her uncanny wonderland, Fay’s oversized artificial fruits, towering plant forms, and intricate faux-skeletons transport us into a realm that simultaneously treats our senses and places us in a diminutive position to his awe-inducing manmade surrealist representations of nature. At a time when humankind is decimating the last of Earth’s megafauna and creating genetically modified seeds meant for a single harvest (suicide seeds), we have cast ourselves into the Anthropocene, where humans are the primary actors causing the death of our ecosystems in what might be termed as the sixth mass extinction. In this disconcerting light, Fay’s large-scale fish and bird skeletons serve as an homage to as well as a warning against our catastrophic tampering with nature—a memento mori signaling to our future’s future. Fay was born in Shanghai in 1943 to a family of artists and moved to Hong Kong while still attending grade school. In 1961, he traveled to the U.S. to study at the Columbus College of Art and Design in Ohio and earned his BFA at the Kansas City Art Institute and MFA at the University of California at Santa Barbara. He then settled in New York City and taught at several art institutions including Pratt (1978-1980), MICA (2000-2014), and at William Paterson College University (1983-2016). Lower Manhattan in the 1980s was a teeming artist haven that included numerous significant artists who had emigrated from China, Hong Kong, Macau, and Taiwan and found New York as a home base including Bing Lee, Kwok Mang Ho (aka Frog King), and Zhang Hongtu, who along with Fay were among the founding members of the Epoxy Art Group (1982-88). Epoxy, whose collaborators varied from five to seven core artists to up to just over a dozen depending on their projects, was based on the idea of artist collaboration and named after the bonding glue that is formed when two parts of the chemical resin are added to another. The group held several exhibitions together, commenting on the geo-political and cultural issues of the time. Fay was also actively engaged with Godzilla: Asian American Art Network, an artist group that forwarded Asian American art visibility during the 1990s with approximately 200 members. The network held a talk with Fay during his exhibition at Exit Art. While in New York, the artist’s personal work shifted from his earlier MFA pieces composed of abstract geometric metal sculptures into his mixed media practice. While Fay still cast in iron and bronze, new techniques emerged in what the artist calls his “studio / greenhouse laboratory” as he increasingly began formulating innovative amalgams of steel, epoxy, paint, paper pulp, gauze, glass, polystyrene foam, rice paper, among his new materials, producing the gigantic and unique hyper-real, textured, and vibrantly colored surrealist gardens of fruits and sci-fi plant forms for which he is known. Fay was greatly influenced by his everyday surroundings in Lower Manhattan as he began to create his large-scale fruit and plant forms, from the fresh fruit markets in the streets of Chinatown to shops such as Pearl River Mart (then on Canal Street), where he spent hours buried in the maze of aisles among imported dishes and every sort of home miscellany. He found Chinatown shops lined with tiny sculptures of the three deities he often references in his work. These folk gods are known as the Chinese Sanxing (three stars) who protect the home with prosperity (Fu), status (Lu), and longevity (Shou). Fay draws upon these folk gods who date back to the Ming Dynasty, having lasted hundreds of years and past changes in regimes, including the communist revolution that prohibited the practice of folk religion. These figurines are commonplace in the homes of diasporic Chinese in the U.S. and elsewhere. 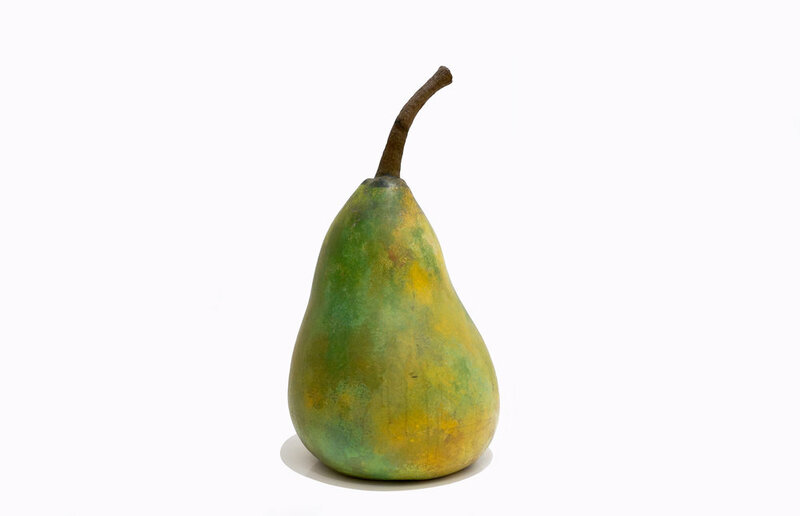 In Chinese folk symbolism the orange represents good luck and fortune, and the pear brings prosperity. Similarly Fay’s gorgeous tangle of money tree branches symbolize prosperity and wealth. 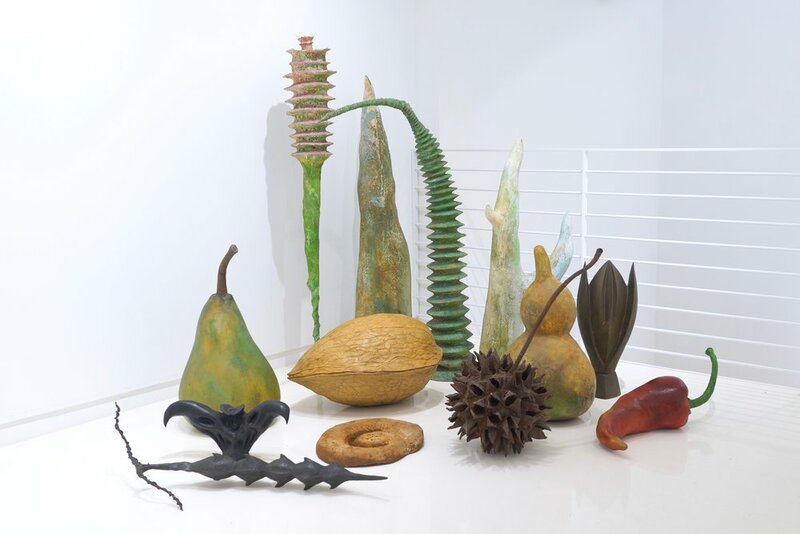 For his sculptures, these plants and fruits have mutated and gained enormous and surreally grotesque size. Fay questions how we have altered the fruit we consume through genetic engineering as well as the increasingly circuitous global paths that our food travels to arrive for our consumption. Through his perfected fruit, nuts and seeds, and symbols of the home, prosperity, and hope for the future, he asks us to examine our everyday and where our futures are leading. Instead of utopic futures of evermore perfect and larger fruits and gardens of wealth that we hope to construct through the manipulation of nature, he asks us to consider our extractive relationship and where we are plunging with our human assumption that we are beyond the control of nature. Yet his work doesn’t stall upon death and an impending catastrophic end, but also invests itself in rebirth and possibility. The spiraling shells are not only the skeletal remains of imagined gigantic prehistoric mollusks from the past, but symbolize for the artist a kind of circular spiral of evolution that brings us to the present and into the future. Fay’s nuts and fruit pits are not detritus, but an encapsulated life, protected, and preserved for the future. These sculptures are arranged like a collection from a naturalist’s cabinet of wonders or alternatively an apothecary of healing—differing expressions of our human relationships to the natural world. 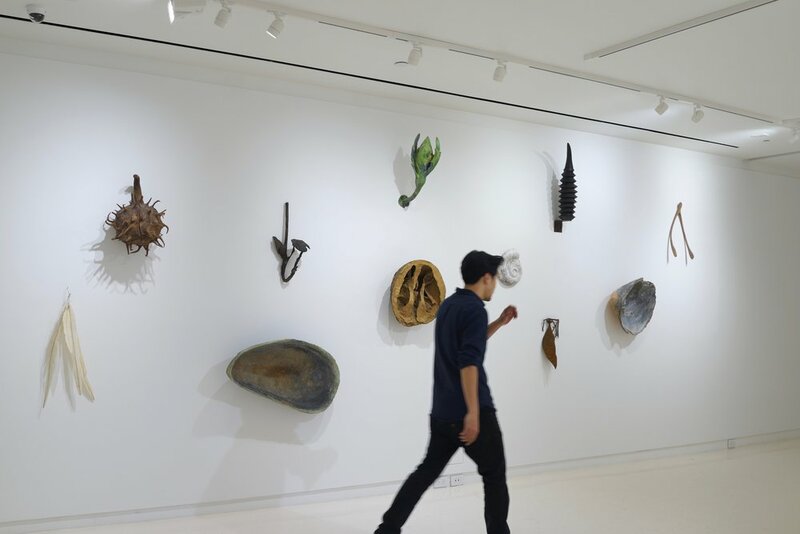 In Beyond Nature, this long wall containing sculptures of past and future life is adjacent to an installation of plant figures that tower above and spill from below. 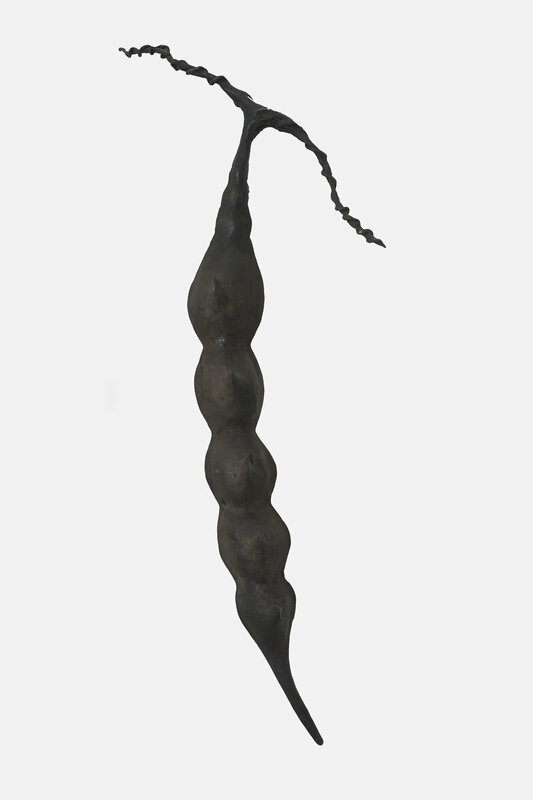 The plant forms, influenced by Brancusi and Picasso’s modernist forms, mimic the skeletal sectional forms of spines and fingers, seeming to grow out of the ground like animated limbs — at once alien and terrifying. Within this altered Sci-Fi universe of alien vegetation and genetically modified foods, Fay also points to our relationship to nature through three newer delicate bronze sculptural renderings of human forms in various poses practicing Tai Chi. 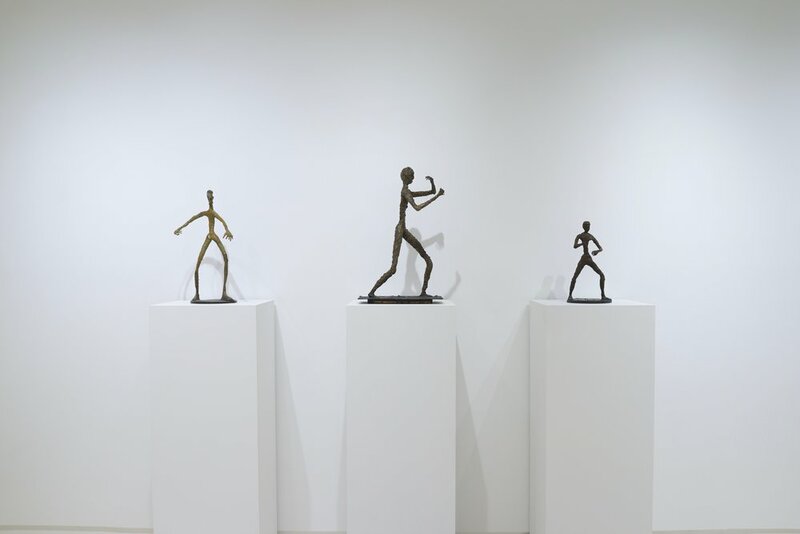 The thin figures, reminiscent of Giacometti’s ephemeral sculptures, similarly gesture to the fragility of human life. 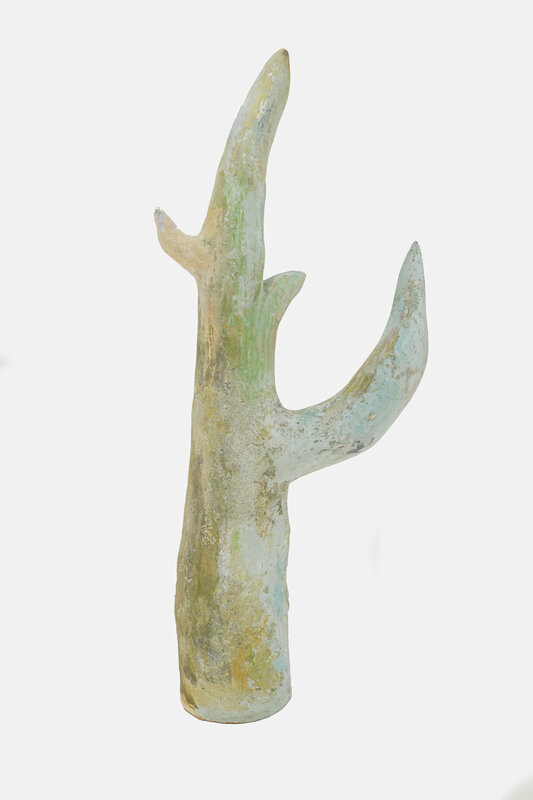 With these works Fay suggests a possible renewed relationship with nature in which we might contemplate a similarly Daoist future with a horizontal respect and relationship between all beings and things. Elizabeth Kolbert, The Sixth Extinction: An Unnatural History. New York: Picador, 2014. Ming Fay in his work comments upon the symbiotic relationship between humans and nature. 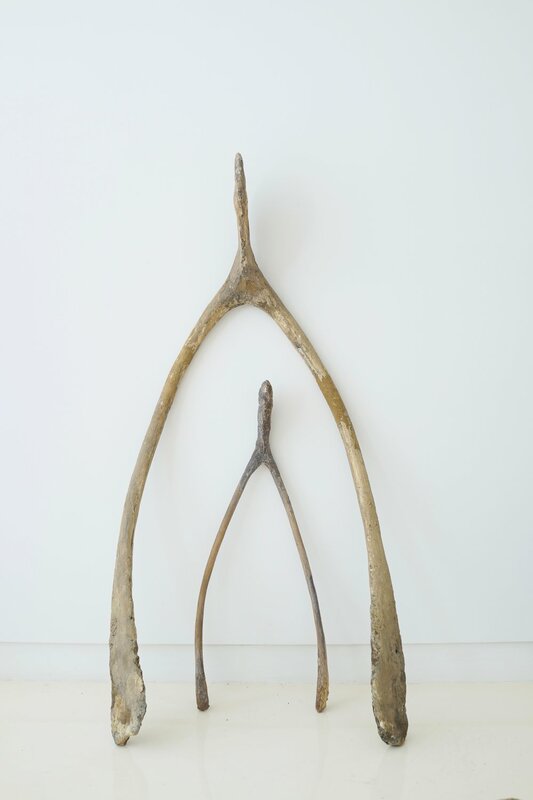 Drawing on an extensive knowledge of both Eastern and Western horticulture and mythologies, along with his close observation of personally collected items such as fruits, seeds, and bones, Fay often reworks nature’s forms in order to fabricate imaginary species. The artist explains, “Much like a scientist, I research and cultivate specific plant forms for their inherent and symbolic qualities, reinterpreting and reinventing them in my studio / laboratory greenhouse.” This results in works that range from oversized plant forms, theatrical garden-like displays, or overgrown sci-fi inspired environments. Fay investigates the parallels between the symbolic meanings of the botanical world and human needs or desires. His installations often capture both the elation and the anxiety that stem from the encounter between humans and the natural world. He focuses particularly on the concept of the garden as a symbol of abundance or a utopia - a metaphorical location for humankind's desirable state of being. Born in Shanghai in 1943, New York City-based sculptor Ming Fay grew up in Hong Kong, moving to the United States in 1961 to attend the Columbus College of Art and Design. He received a BFA from the Kansas City Art Institute and an MFA at the University of California, Santa Barbara. Fay has exhibited extensively in the United States and abroad. He has additionally received numerous commissions for public art projects worldwide. Alexandra Chang is a curator, writer, and arts scholar. She is currently Curator of Special Projects and Director of Global Arts Programs at the Asian/Pacific/American Institute at New York University, where she organizes the Climate Working Group and directs the NYU Global Asia/Pacific Art Exchange (GAX). In Fall 2019, she will take on the role of Associate Professor of Practice at Rutgers University, Newark's Art, Culture and Media Department and Clement A. Price Institute on Ethnicity, Culture, and the Modern Experience. Chang is also director of the Virtual Asian American Art Museum and Co-Founding Editor of the journal Asian Diasporic Visual Cultures and the Americas (ADVA), Brill (Leiden). She is the co-founder of the College Art Association’s affiliated society the Diasporic Asian Art Network (DAAN). She is the author of Envisioning Diaspora: Asian American Visual Art Collectives from Godzilla, Godzookie, to the Barnstormers (2008 Timezone 8) and editor of “Circles and Circuits: Chinese Caribbean Art” (Duke University Press, 2018).